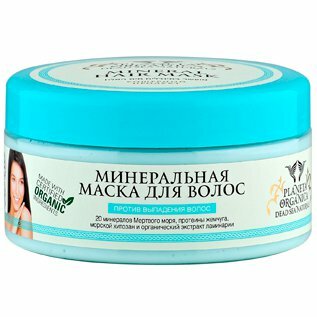 Anti-Hair Loss Mineral Mask is produced by the Russian beauty brand Planeta Organica for its Dead Sea Naturals series. Dead Sea water is known for its unique healing properties. It is rich in essential minerals which have a powerful strengthening and regenerating effect on the hair and scalp. This Anti-Hair Loss Mineral Mask is formulated with 20 minerals contained in Dead Sea water. It penetrates deep into the hair structure, nourishes and strengthens hair follicles, prevents excessive hair loss and stimulates hair growth. The mask contains organic laminaria (kelp) extract that stimulates hair follicles and makes your hair grow faster. Pearl protein provides the hair with essential amino acids, effectively restores its keratin layer, prevents hair loss and brittle hair. Marine chitosan actively nourishes the hair, makes it stronger and improves its elasticity. Ingredients. Aqua enriched with Dead Sea Salt Minerals, Cetearyl Alcohol, Cetyl Esters, Behentrimonium Chloride, Cetrimonium Chloride, Rosa Canina Seed Oil, Prunus Armeniaca Seed Oil, Bis-Cetearyl Amodimethicone, Glyceryl Stearate, Laminaria Digitata Extract*, Aminopropyl Phenyl Trimethicone, Cyclopentasiloxane, Panthenol, Pearl Powder, Chitosan, Niacinamide, Benzoic Acid, Dehydroacetic Acid, Benzyl Alcohol, Parfum, Hydroxyethylcellulose, Lactic Acid. Want to buy Anti-Hair Loss Mineral Mask? Call us or submit your order via our web site! Planeta Organica Dead Sea Naturals is a line of cosmetic products manufactured by the Russian brand Planeta Organica that specializes in the production of natural and organic cosmetics made with high-quality ingredients from all over the world. The line is formulated with Dead Sea minerals and certified organic plant ingredients. Its quality is confirmed by trustworthy certificates issued by reputable organizations. For instance, the line is kosher certified by the Chief Rabbinate of Russia. Planeta Organica Dead Sea Naturals includes about 40 different beauty products for skin, hair and body care. They include, but are not limited to, bath salts, natural Dead Sea mud, shampoos, hair conditioners and masks, facial creams, masks and serums, shower gels, hand and foot creams, anti-cellulite body wraps, scrubs and peelings, body creams and gels. All the products do not contain potentially harmful ingredients such as parabens, SLS and SLES (sodium lauryl sulfate and sodium laureth sulfate), petrochemicals, etc. A separate line of body care products in the Dead Sea Naturals series is designed to combat cellulite and excessive weight. These products contain special complexes such as UNISLIM, InterSlim and LIPOCARE which help to get rid of cellulite and prevent premature skin ageing. The complexes are combined with natural plant extracts, essential oils, vegetable oils and Dead Sea minerals for maximum effectiveness. The Dead See has an enormous healing potential. Its salts have been used for therapy and as cosmetic ingredients for centuries. Cosmetic products formulated with Dead Sea minerals provide gentle yet effective care for your skin and hair. All you have to do is choose the products that are just right for you from a wide selection offered by Dead Sea Naturals. We can guarantee that the result will not disappoint you!